Of course, with everyday that passes my memory of the bad roads fade. To me, the road was fantastic, fantastic for one person riding a 125cc dirt motorcycle, not for a passenger on the back of that bike. All that flashes through my brain are visions of making love on the beach, eating lobster and swimming in turquoise waters. We make plans to ride out on Sunday, I figure that will give us the best chance for a vacancy at the one hotel in the area, and the beach should be less crowded. Saturday morning we are preparing to ride to the gym when I came up with the great idea. Heidi is all over that. I love how we can make ‘on the fly’ plan changes. She is definitely a ‘dream girl’ in my book. 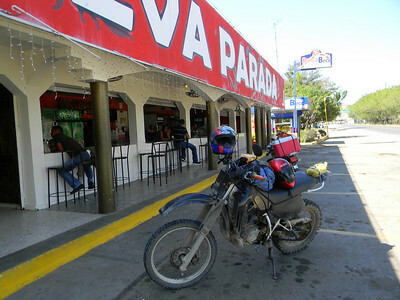 Anyway, I know of a nice hotel in Navarrete, a little less then halfway to Punta Rucia. The hotel has a restaurant on site complete with cloth napkins and all. Sounds good. We pack up and go. The ride to Navarrete is uneventful. We arrive in there around 2:00 PM. After checking into a $28 room, we notice a large swimming pool in the back. The pool is blasting music and serving beer and food poolside. We put on our suits and head out. A waiter comes over to us right away and wiped down our lawn chairs and table. We order two ice-cold beers and proceeded to play cards. Throughout the afternoon groups of families, adults and young people filter in. There is a huge open-air seating area adjacent to the pool and dozens of tables and chairs surrounding the pool. The area seats close to a hundred people. Everyone is there to eat and drink and some are there to swim. People are required to purchase a wristband if they are there to swim and are not staying at the hotel. The scene is very Latino, families and young people, eating, drinking, and just being together. Everyone swimming wore either a t-shirt or shorts. Some had bathing suits underneath. It is fun being in the middle of and part of all the action, People are dancing, swimming and chasing each other around, talking and laughing. 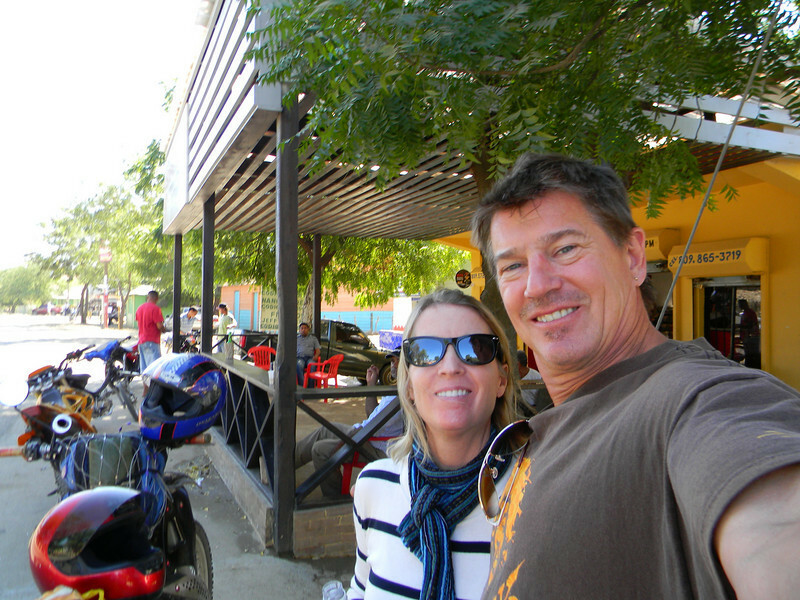 There are no tourists in Navarrete. 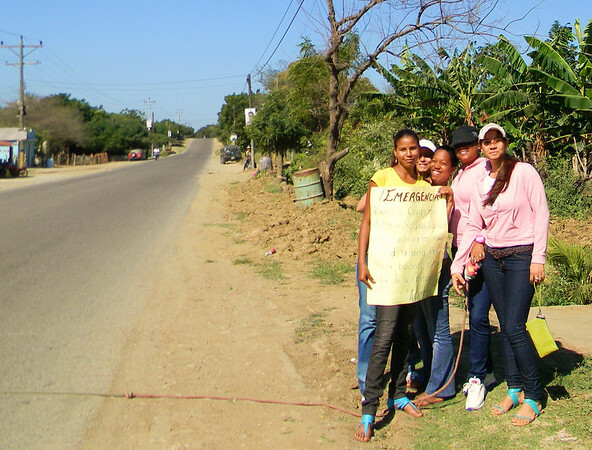 This is the real Dominican Republic. 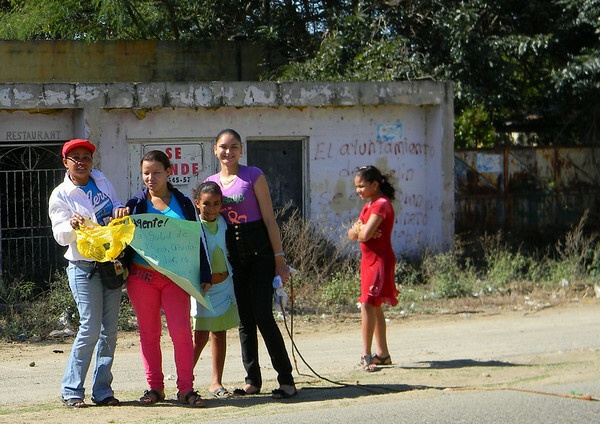 It is a refreshing feeling to us compared to the sleaze and corrupt feeling of the tourist-clogged villages, Cabarete and Sosua. 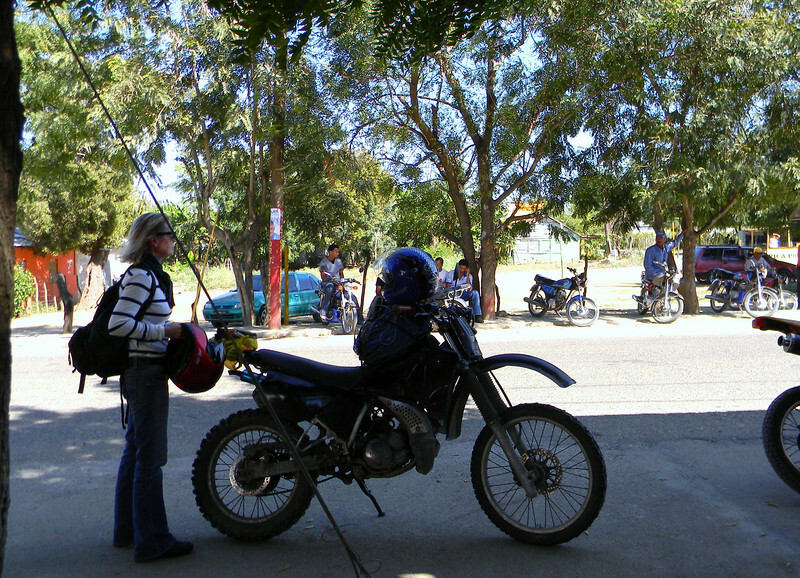 The next day we are riding along the Cordillera Septentrional Mountains. We are looking for a dirt road turnoff to Punta Rucia, this is where we will start to ride up and over the mountains for the second time in two days. Super. 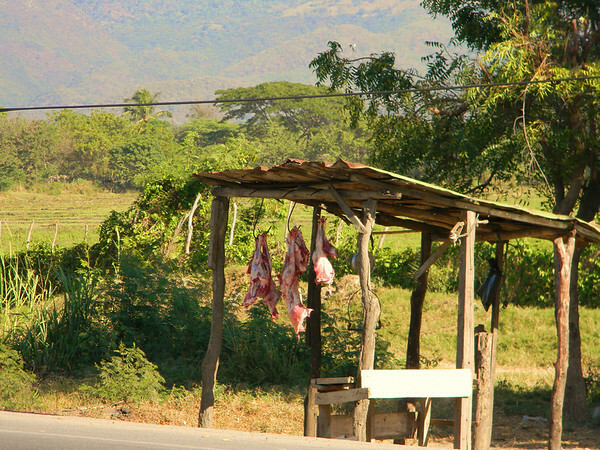 Hanging raw meat on the side of the road is a common sight in rural Dominican Republic. This is to attract buyers. We decided to eat breakfast on the road today. I see what looks like a roadside cafeteria and pull in. This place is huge, next to the counter is a dance section lined with tables and chairs. Giant speakers are blaring music. There are open seating right in front of the speakers. I first sit there but was soon blown back by the volume. We squeezed into a spot at the end of counter. 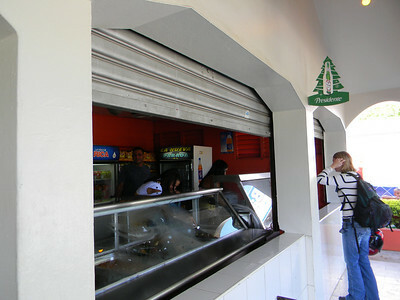 There is a lot of food under the glass counter. I tried to order what I thought was scrambled eggs with green and red stuff. It was not scrambled eggs but I ordered it anyway. 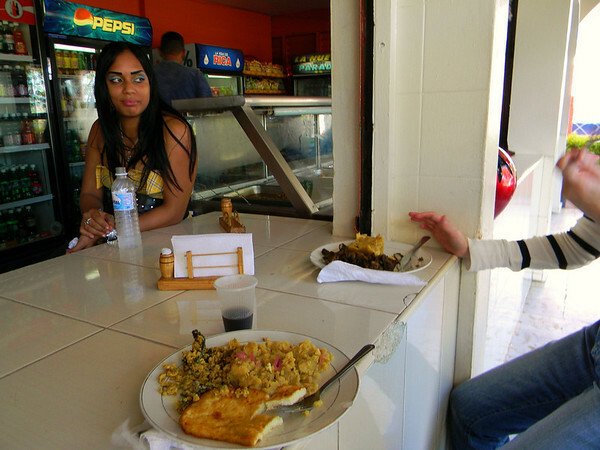 I also ordered mangu and fried cheese. Heidi ordered a similar plate except she got beef instead of the mystery stuff I ordered that looked like eggs. It sure looked good but everything was hard like it had been sitting out all night. The mangu usually is soft like mashed potatoes but this stuff was hard and came out in squares. The stuff that looked like eggs tasted like a cross between fish and algae. Heidi said her beef was like grizzly beef jerky. We are hungry but finished less then half. This is the lowest food experience we have had on the island. 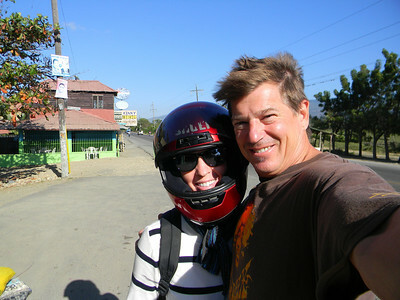 We ride on through beautiful rural DR. We pass through farmland, rice paddies and banana plantations. The landscape is more arid here then what we are accustomed to along the north coast, but beautiful all the same. Oh Oh, roadblock. I pull off the road, turn off the engine and ask what this is about “?por que?” It is for some type of community emergency effort. I dig into my pocket and hand over my change with a big smile. I try to stop often at small grocery stores called ‘colmado’. We rest our butts, hydrate and talk. Of course, she is 100% correct. She gives me ‘the look’, the one that says, ‘I am crazy about you, but you better listen’. I love that look. “And you call yourself a big adventurer. You put us at risk!” I had to eat it and agree. I kiss her passionately and tell her that I love her like mad, and that I will not do it again. Where did I find this woman!